The High Value Cart – Work Station (HVC-WS) is a portable and secure storehouse for protecting valuable electronics and equipment that doubles as a functional computer desk. Staff can easily maneuver this versatile piece of equipment using the two swivel-with-brake and two rigid casters. This portable workspace includes a spacious locking cabinet to protect valuables from theft. An open area above the cabinet and the top shelf contains a cushioned anti-slip mat, a keyboard tray, and a six-outlet power strip. These features make it easy to reposition a computer anywhere in the facility with a single power cable to plug in. 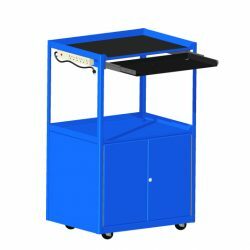 This compact work station has a great deal of functionality, and it allows staff to roam the warehouse while keeping crucial supplies secure. To learn more about the High Value Cart, contact our sales team at 1.800.BHS.9500 or download a detailed PDF above.